Since the fire I’ve been feeling a little lost. 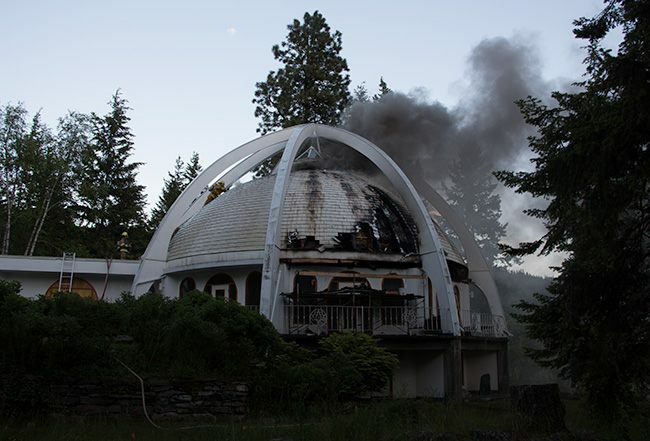 No, that’s not completely accurate, because I was feeling a little lost before June 5th when flames and smoke crept up over the roof of the Temple of Divine Light at the Yasodhara Ashram. The subsequent demolition of the temple has been difficult for me to come to terms with. Seeing pictures of the damaging attempts at saving the building were horrific enough. Blackened sections of the roof. Doors flung wide open dissolving the boundary between inside a sacred space and outside. Now there’s simply nothing there. A flat foundation. A structure reduced back to its original, unseen form. I feel homeless. I feel like a leaf blowing in the wind. I feel lost. I know these things are my own. They are not solely the result of a large flat space that used to house a physical structure. But I also know they’re related. I’ve been checking in with what I’m learning in my “living alone experiment 2.0.” The findings have been pretty substantial. I’m the one responsible for my day, for the activities that fill it, for how often I clean the bathroom or do the dishes. I’m experiencing a great level of empowerment. There’s also a bit of lostness. What does it mean to create a lifestyle, to find communities to be a part of, to give to and take from society? What if I don’t want to leave the house on a rainy Sunday? If I just can’t pull myself out the door? It means sometimes I’m going to feel a little lost. But now, I can’t simply shove it onto someone else, or distract myself with a partner in order to fill that hole inside of me. I am incredibly blessed to have a strong foundation based on the work that I’ve done through the tools offered from my spiritual home. Kind of like the foundation that made it through the fire and deconstruction. The transitions I’ve been through in the past seven months have kind of felt like a fire, and up until the beginning of June, I’d always had a strong connection to a physical place that makes me feel whole despite whatever flames rage around me. Now that space is gone. The over a thousand hours I spent there and life-changing and meaningful memories I’ve had there are left to be exactly that: memories. A hole is left and it makes me feel lost. A place of deep peace and rest has been disturbed. The wind came come now and blow out the candle. My challenge, then, is to go even deeper. To focus on the place where wind can’t blow and fire can’t bring down. To place the seed of sacred space previously held in the eight-doored temple in the places I choose to worship at any moment. I know I can never be lost from that place. I know that it is part of me and follows me wherever I am. I also know in that flat empty space will be created something new, that this opportunity to re-create is exciting and empowering. So I’ll do exactly that; I’ll take this lostness and open my arms wide to it, honouring it with space. And in that space I will create anew. Guenevere, I feel very sad also about the fire. In fact, working on the platform last week, I cried and cried… being in this place without what I think I know belongs there. Then a funny thing happened: I was removing nails from a piece of wood, and cut my finger. It drew a bit of blood, and now there’s a scratch left over. It wasn’t until the next day that I realized the cut was on my ring finger on my left hand–the finger of commitment and love–and thought, How perfectly symbolic. I am committing to healing and rebuilding the temple in my heart. And then I felt less lost. Still, on the ferry ride back to Nelson, I found myself absentmindedly looking for the temple, but didn’t see it. Oh Ashley that’s beautiful. Thanks for sharing.